Calling all adventurers and thrill seekers to explore the beauty of Charmadi Ghat. The lofty hills are perfect for a trek and the views, soothe sore eyes. Linking Chikmagalur to Dakshina Kannada, Charmadi Ghat is part of the Western Ghats and has on display one of the best views the State has to offer. Snaking through lush mountains, the winding road attracts travellers and adrenaline junkies who want to soak in the picturesque setting. 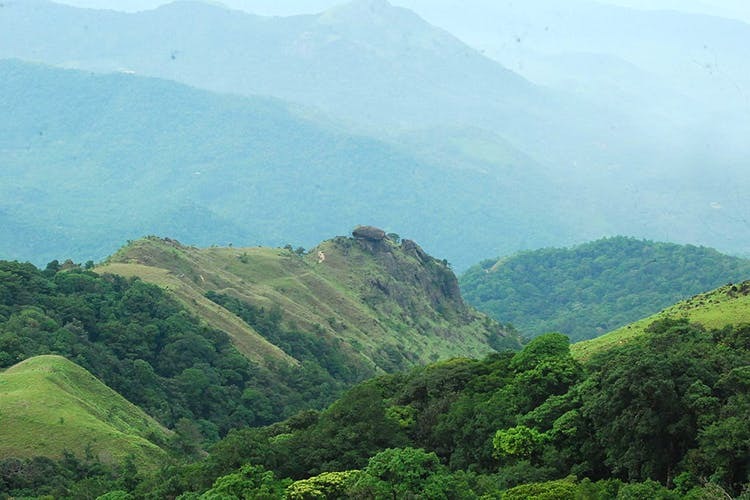 If you only want to take in the views, then, Charmadi Ghat can be easily accessed on a road trip to Mangalore or on a one-day trip from the city. As you make the climb and navigate the hair-raising, hairpin bends, you come face-to-face with a series of mountains swirling in mist and carpeted in green. Waterfalls too are common here and add to the charm of Charmadi Ghat. To make the most of this slice of paradise, we recommend a weekend’s stay in Chikmagalur. Your hotel or homestay will usually be able to offer the services of a local guide who can lead a trek into the mountains. Ballekallu and Kodekallu are especially popular withe seasoned trekkers and great places to catch a sunrise. Nearby, the Ballalarayana Durga Fort, sits atop a mountain, and is one of the most challenging treks that this Ghat section offers. You can also stop by the Bandaje Arbi Falls on your way to the top. These treks require special permission so ensure that you approach the local forest department or enquire with your hotel well in advance so that your trip goes without a glitch. The best time to visit is on a clear, summer day or after the monsoons, when the rains have ensured that the region is lush. When the mountains are not clogged in fog, you can even catch glimpses of the Konkan coastline from your vantage point on Charmadi Ghat.